Heat oven to 350°F. In a medium bowl, whisk together the flour, ginger, baking soda, cinnamon, salt, nutmeg, pepper, and cloves. 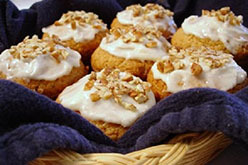 Using an electric mixer, beat the shortening and sugar on medium-high speed until fluffy, 2 to 3 minutes. Reduce speed to low and beat in the egg, molasses, and vanilla. Add the flour mixture, mixing just until combined (do not overmix). Place the granulated sugar on a plate. Roll heaping tablespoonfuls of the dough into balls; roll in the sugar to coat. Place on parchment-lined baking sheets, spacing them 2 inches apart. Using a glass, press the balls to a 3/8-inch thickness and sprinkle with more granulated sugar. Bake, rotating the sheets halfway through, until the edges are firm, 10 to 12 minutes. Cool slightly on the baking sheets, then transfer to racks to cool completely. 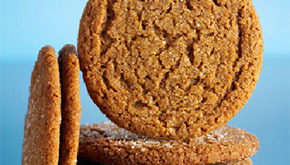 Store the cookies in an airtight container at room temperature for up to 5 days. Sprinkle yeast over the 1/2 cup lukewarm water. When dough is thick enough to start pulling together in a ball, reduce speed appropriate for kneading. Add no more flour than necessary for it not to be sticky. Knead for about 15 minutes. Extended kneading may help make dough light and soft. Stir together 1 cup granulated sugar, 1/2 cup brown sugar, and 3 tablespoons cinnamon in small bowl. Brush with remaining butter (but leave about 1/2 inch at long side [on other side from you] with no butter so it will stick when rolled up). Roll up dough from longer side [close to you], snug but not too tight. Cut dough with sharp knife (or dental floss--if you know that trick--crossing it around roll and pulling quickly) in slices approximately 1" thick. Arrange in pan and cover loosely with foil (coated with non-stick spray so it won't stick). Remember not to crowd the pan as that will make them doughy, and not cooked all the way through. They will rise and spread. Brush a bit of butter between sides of rolls so that when they rise they won't stick completely to each other--helps separate them when you serve them. Mix ingredients with 2 tablespoons warm water. If it is too thick, add additional warm water until it is thin enough to drop easily from a spoon. After rolls are shaped and arranged on pan, cover and place in the refrigerator to rise overnight (8 to 10 hours). Sift together flour, sugar, brown sugar, baking powder, salt, and cinnamon. Combine egg, oil, and milk, add to dry ingredients. Stir just enough to moisten. 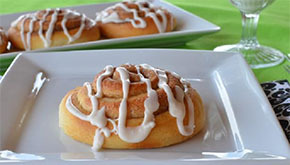 Use powder sugar and milk for frosting (it will make them taste like a cinnamon roll). 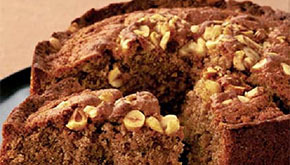 In a large bowl, combine flour, sugar, brown sugar, baking powder and cinnamon. Mix together. Add all remaining ingredients and stir until flour mixture is moistened. 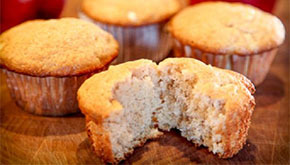 Spoon batter into 2 greased or paper-lined 12-cup muffin pans. Bake at 375 for 19-23 minutes or until lightly browned. Cool for about 5 minutes before removing from pan. Whisk together sugar, vanilla and butter in a large bowl. Add raisins, oatmeal and milk and eggs, whisk well and set aside. In another bowl, whisk flour, baking powder, baking soda, cinnamon and salt, then add the wet ingredients to the dry and mix well. If batter is too thick, add a little more milk. 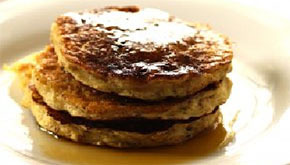 Heat the vegetable oil in a large, non-stick pan over medium heat and add batter in small batches, about 1/4 cup each. If batter is thick, you may need to press down on each with the back with a spoon to flatten. Cook until golden brown on the bottom and bubbly on top, then flip and cook the other side until golden brown, about 3 minutes. Serve hot with maple syrup or peanut butter. Preheat the oven to 180C/gas 4/ fan 160C. Butter and line the base of a 20 cm round cake tin. Put the butter, sugar, eggs, flour, baking powder, cinnamon and milk into a bowl. Beat with a wooden spoon for 2-3 minutes or with an electric hand mixer for 1-2 minutes, until light and fluffy. Tip three quarters of the mixture into the tin, spread it level, then spoon the Nutella on in four blobs. Top with the remaining mixture, swirl a few times with a skewer, then smooth to cover the Nutella. Sprinkle with the nuts. Bake for 1 hour to 1 hour 10 minutes, until risen, nicely browned, feels firm to touch and springs back when lightly pressed (cover with foil if it starts to brown too quickly). Cool in the tin for 10 minutes, then turn out, peel off the paper and cool on a wire rack. Wrap tightly in double thick foil to keep fresh for up to a week. For the cinnamon toast, place the cream, eggs, sugar and cinnamon into a bowl and whisk to combine. Dip the bread slices into the cream mixture until thoroughly soaked. Melt the butter in a large frying pan and fry the bread for 2-3 minutes on each side, or until golden-brown. Set aside to keep warm. For the yoghurt, place the yoghurt and honey into a bowl and mix well. For the rhubarb, place the chopped rhubarb into a small ovenproof frying pan and sprinkle with the sugar. Cook over a medium heat for 2-3 minutes, then transfer to the oven and bake for 10-12 minutes. 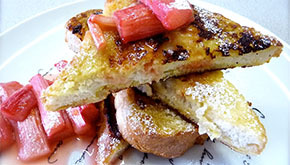 To serve, place the toast onto a serving plate along with the roasted rhubarb and the yoghurt. Preheat oven to 175C/350F/Gas 4. Line three 20cm/8in sandwich tins, but don’t grease them. Whisk the eggs lightly in a bowl until foaming, then slowly whisk in the sugar using an electric whisk. Set the bowl over a pan of simmering water and continue to whisk until the sugar has melted. Remove the bowl from the heat and continue to whisk until the mixture reaches the ribbon stage. Mix the cinnamon, nutmeg, flour and corn flour together in a bowl. Sift one-third of the flour mixture into the egg mixture and gently fold together. Repeat with the remaining flour mixture until well combined. Beat a small amount of the cake batter into the butter, then fold this mixture into the rest of the cake batter. Divide the cake batter among the cake tins and bake in the oven for 15-20 minutes, or until a toothpick inserted into the centre of the cakes comes out clean. Remove from the oven and set aside to cool. Once cooled, run a round-bladed knife around the inside edge of the tins and turn out onto a wire rack to cool completely. Meanwhile, for the caramel meringue butter-cream, whisk the egg whites in a free-standing mixer until frothy. Add the cream of tartar then whisk until stiff peaks form when the whisk is removed. Heat the water and sugar in a saucepan until the temperature reaches 115C/238F (use a sugar thermometer to check this). Pour the hot syrup down the side of the bowl of egg whites and continue whisking until the mixture is glossy and cooled. Then slowly beat in the butter a little at a time, ensuring all the butter is incorporated before adding more. The icing will be thick and smooth. For the sugar syrup, heat the sugar and water over a medium heat until the sugar has dissolved and the volume of the liquid has reduced slightly. Add the vanilla extract and set aside to cool. To decorate the cake, brush the cakes with sugar syrup using a pastry brush, then use the caramel icing to fill and ice the top and sides. Soak the bran in the milk for five minutes. Sift the flours, sugar and baking powder into a bowl. Add the bacon, lemon zest and cinnamon. Heat the honey and melt the butter in a small saucepan over a low heat. Off the heat, beat in the egg, yoghurt and bran with its milk. Stir the wet ingredients into the dry ingredients in the bowl. Spoon the batter into muffin cases and bake in the oven for 20-25 minutes.